A while ago* I ran a mini-competition to choose a motto for the Frankenstein Corps, as featured in the imminently-arriving Anno Frankenstein. Simon Parr's design for the Corps' logo already has a motto (which translates as 'Waste Not, Want Not') but a number of inventive individuals came up with their own suggestions. I've now, finally, drawn up a shortlist and I'm giving you a week to vote for the one you like best, via the poll that you'll find at the end of this link. And whoever you choose as the winner will receive the following unique** prize. So, click on the caption you like best and on 5 May I'll announce the winner - at long, long last. * Far too long ago, to be honest. ** And it really is unique. 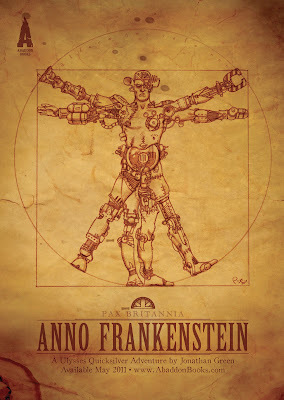 Nobody else is going to be receiving one of these Anno Frankenstein puzzles featuring Mark Harrison's cover artwork.